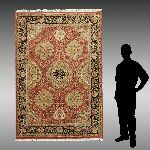 1419 PAKISTANI PERSIAN HAND KNOTTED WOOL RUG, 5' X 7': Large mostly pastel colored ovoid shaped medallions and half medallions make up the design on the soft red/rust field that is edged by a dark blue border. 1430 DAUM NANCY CRYSTAL BIRD AND LALIQUE POLAR BEAR: 1) Daum Nancy crystal bird with head turned as if observing something. Frosted accenting with Daum, France hand etched on front lower base. Approx. 7.25'' h x 13.25'' l x 5'' w. 2) Crystal art polar bear by Lalique with a clear crystal fade to frosted crystal finish. Lalique, France hand etched signature on left hind leg. Approx. 6'' h x 7.25'' l x 6.5'' w.
1434 HEISEY ''LARIAT'' PUNCH BOWL & 12 CUPS: Comprised of 1 punchbowl, 1 underplate, 12 handled cups, and 1 serving ladle. All pieces are in the Lariat pattern by Heisey company of Newark, Ohio. Punchbowl approx. 6.25'' h x 15.25'' w. Underplate approx. 1.5'' h x 20.5'' w. 12 cups approx. 2.25'' h x 3.25'' w, & 4'' w @ handle, ladle approx. 13.75'' l x 3'' w.
1435 19th CENTURY HIGHAM ROCKER LID BOX: Large blown glass bottle cased in a Higham rocker lid box with original fiber insulating material. Made in Illinois with impressed burn makers marks on both sides of rocker lid. Approx. 24.5'' h x 15.5'' l x 13.5'' w.
1438 HAGERMAN, Kent, (American, 1893-1978): 1) Christmas Makin; 2) Fishing Scene; 3) Syrup Making; 4) Swanee River Afternoon; 5) Florida's Cattle Empire; 6) Swanee Ferry; 7) View from The Veranda. 10' x 13'' with margins, all pencil signed and numbered, all unframed. 1447 3 LLADRO FIGURINE LOT- 3 piece Lladro figurines to include 1) ''Sunning'', Spanish name ''Desnudita Con Pamela'', sculptor Salvador Debon, issued 1985, retired 1987, 9'' h. 2) ''Sunning in Ipanema'', Spanish name ''Banista De Ipanema'', sculptor Regino Torrijos, issued 1990, retired 1993, 11.75'' h. 3) Lladro princess figurine, glazed, 12'' h.